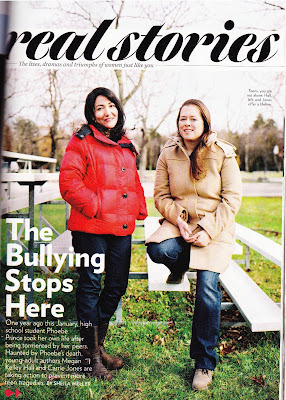 So you may remember last spring when I first told you about Young Adult Authors Against Bullying (YAAAB), the ingenious organization starting by authors Megan Kelley Hall and Carrie Jones. Well, these authors have taken it one-step further and put together an anthology that’s been garnering quite a bit of buzz. 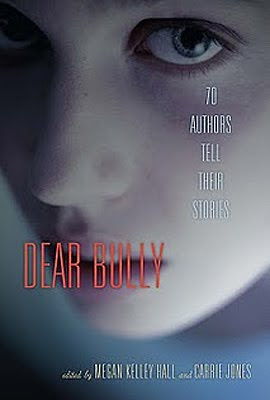 DEAR BULLY: 70 Authors Tell Their Stories, edited by Hall and Jones, let’s us share our personal bullying accounts with teens, and I’m excited and proud that I’ll have an essay in the mix with some incredible authors. 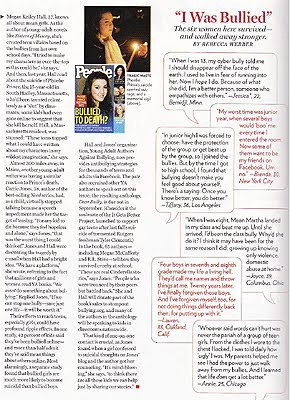 The anthology debuts this fall and has already been featured in Publisher’s Weekly and now February’s issue of Glamour magazine! Let’s hope this book brings more light to the bullying epidemic in this country. I know Megan and Carrie are already getting emails from teens about how YAAAB has had a huge impact on their lives. They’re using the Facebook page as an outlet, and many plan to contribute essays (along with other young adult authors) to the new YAAAB website that is coming soon. Thanks for blogging about this, Diana! I linked to it on Facebook (I would have tagged you, but you NEED to get a Facebook account first (nudge, nudge)!! The website that we are launching is going to be called DearBully.com. There’s a placeholder there right now, but we will hopefully get it up and running soon!